A very significant part of Educational Technology Leadership is devoted to professional development, new systems implementation, and the long term planning of support. Every year as the semester starts-up, administrators around the world are planning for professional development (PD). There is pressure during those initial weeks to try and rapidly develop the faculty within new areas, to help everyone review all current requirements, and to re-train in areas of concern. Many of these areas rely highly, or solely, upon technology; technology is often the center of the professional development process. Year after year, group after group, and plan after plan, results tend to be the same. There is never enough time to meet everyone’s agenda, teachers feel rushed, and confidence among many is low but silenced. So why do organizations follow this same pattern? This is the only fair way to expose EVERYONE to EVERYTHING. The goal is not mastery; the goal is introduction; mastery comes later. Large groups working together help to create future support groups; the process is team building. Support and resources for PD are easier to manager in mass; the first week or two of the new year shift support to critical needs. The Pareto principle (80/20) is taught in economics, business, marketing, etc., because when tested, it tests true. 20% of users create 80% of the technology support tickets. 80/20 is often seen as a negative metric, when in fact, is a great opportunity to improve PD outcomes. 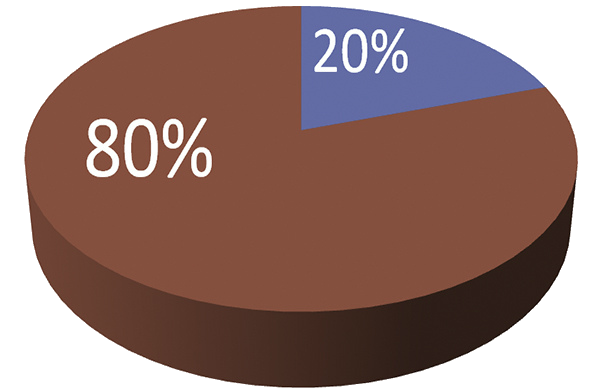 Following the 80/20 rule, any given PD item needs to be mastered by only 20% of the organization in order for the entire organization to benefit. This entry was posted in Educational Technology, Instructional Technology, TIEONLINE, Tony DePrato and tagged 80/20, learning, Mastery, PD, Training. Bookmark the permalink.